David has named it the “Born to Run Home Challenge” as it starts at the site of the former maternity hospital in Hastings where he was born, and finishes at his home near Ipswich. His challenge is made more daunting though, as he plans to run the entire journey across two days without a single minute sleep – arriving the day before he turns 60 on May 5.The amazing thing is that he will have very little in the way of support and will be carrying what he needs for the challenge and stocking up with food and water at various points by nipping into supermarkets or in some places where he may have assistance from friends. David has chosen Activlives as one of the charities he would like to support as he attends many of the services as a carer for his mother in law, who also lives with them and has advanced vascular dementia. Lindsay Bennett Activhubs Development Manager says, “Activlives provides many varied activities that help to keep older adults socially engaged and active; this is a life line for many of our members living with complex health issues including Audrey, David’s mother-in law”. 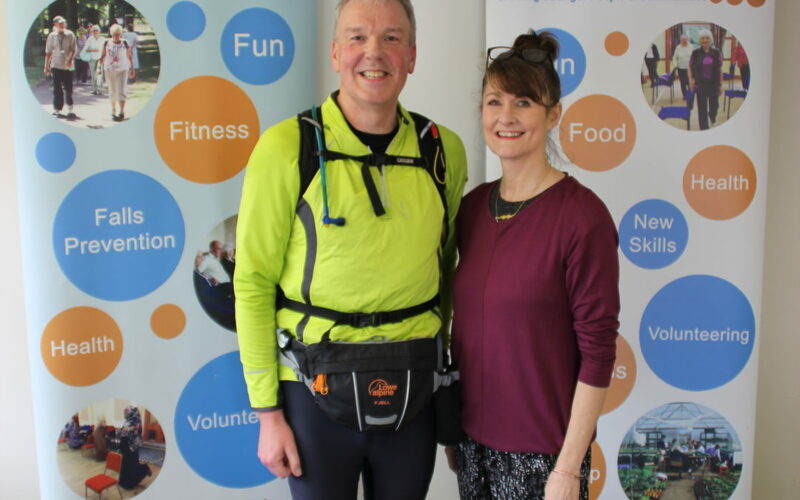 ActivLives would like to say a big Thank-You to David as this is a truly amazing challenge and we are honoured that you have chosen ActivLives as one of your Charities. David hopes to raise £10,000 to share between the two charities. If you would like to donate please go to his just giving page: https://www.justgiving.com/fundraising/borntorunhome or speak to a member of ActivLives or your activity leader and ask to fill in a sponsor form pledge. Many thanks in advance for your continued support. Lindsay Bennett Development Manager.